We are currently in the lull between winter and the first vegetables of spring. As the land wakes up after a long rest it can be hard to find inspiration in what remains of winter vegetables. I do however suddenly acquire a sweet tooth and crave maple syrup on everything. I am thankful for the incredible nourishment and sweetness mother earth provides to us. In search of inspiration for this week’s recipe my partner and I took a trip to the Cambridge Farmers’ Market. What I found there were many winter root vegetable staples such as, carrots, parsnip, shallots, and beets. We also found some not too bad tasting hydroponic tomatoes, even though I much prefer field tomatoes. I was also pleased to find some great fresh fish from the fishmonger, we took home a side of lake erie pickerel. 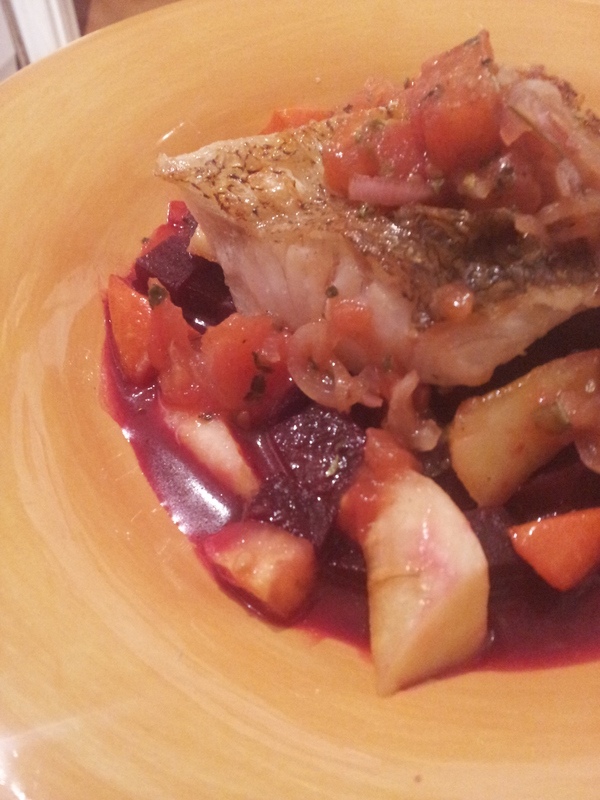 When cooking fish it is important to pair it with flavours that compliment it, not overpower it. When preparing this week’s recipe I knew it would be a challenge to balance the natural sweetness of the ingredients that were available to me with the delicate flavour of the fish. One way I attempted to do this was by using apple cider vinegar. Sometimes cooking with ingredients you wouldn’t typically put together teaches you other ways to achieve the end result you are looking for. Peel and dice beets, slice shallots. Sweat half of the shallots on low heat in a small amount of oil. Add beets and a generous amount of water and a splash of apple cider vinegar. 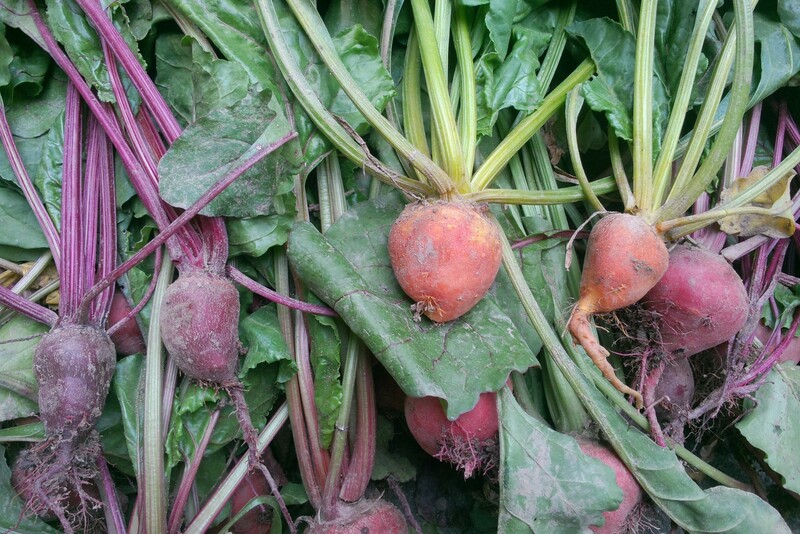 Cook until beets are tender, adding more water as needed. The final product should be just enough liquid to cover the beets in the pot. Let other half of shallots sit in a small bowl with a small amount of salt and some maple syrup. Let sit for 30 minutes. Heat a pan to high heat and char shallots, add tomatoes let cook for 15 – 20 seconds and deglaze with a couple splashes of apple cider vinegar. Remove from pan and put mixture in a bowl. Add any soft herbs you have. Adjust balance with salt, vinegar and maple syrup. Cut root vegetables in an interesting dice. Cook on medium heat in a small amount of oil until golden brown and soft. If you wish you can score the skin of the fish a couple times to prevent it from curling up when being cooked. Season with salt and cook on medium heat until the fish changes colour on the sides from raw to opaque. Flip over, turn off heat and let rest to finish cooking. Plate it however you like. I plated mine with beets on bottom with some of the cooking liquid, the root vegetables, the fish resting on top of them and a bit of the salsa on top of the fish.